Earn 275 - 450 points upon purchasing this product. An ever-growing amount of Western and Eastern research has concentrated on the potential for Artemisinin and its derivatives, as a source of naturally occurring anti-tumor mechanisms, for inhibiting the growth of prostate, lung, cervical, and thyroid tumor cells, and for use as tumor chemotherapy that is nontoxic to normal human cells. Use 2750 - 4500 points to purchase this product! In limited studies, Artemesinin found within the herb Artemisia annua targets and kills tumor cells while healthy cells are unaffected. Although initial study results are still in the earliest stages, the results are promising. Artemisinin creates pro-oxidant effects when it comes into contact with cells that exhibit high levels of iron. Although anti-oxidant effects are generally what yield positive health, there are specific instances where oxidation is actually beneficial. Researchers are now looking at specific compounds tat provide pro-oxidant effects and Artemisinin seems to fit the bill. When in the presence of iron, the two oxygen atoms in Artemisinin break down. In turn, selective free radicals are produced that destroy the iron that’s found in both tumor cells and malaria parasites. Basically, once Artemisinin comes into contact with iron, it produces free radicals that specifically target and damage tumor cells. Amazingly, in tumor cells, iron levels can be 1000 times higher than normal cells. This is exciting, as Artemisinin could potentially act as a non-toxic tumor treatment. Since most tumors have large concentrations of iron on their surface, Artemisinin is believed to make a significant impact. In laboratory settings, resistant breast tumor cells that accumulate high concentrations of iron were significantly impacted by Artemisinin. After 8 hours, Artemisinin had 75 percent tumor killing properties and after 24-hours, 100 percent killing potential, based on cells that were loaded with iron. • Sedative effects: This supplement contains compounds that help calm and relax both nerves and muscles. In turn, this helps promote relaxation and sleep. • Anti-inflammatory: Artemisinin has been shown to reduce inflammation, swelling, and pain. It’s also been used to treat GI issues and a variety of autoimmune diseases. • Anti-bacterial: Artemisinin offers anti-bacterial properties and for this reason, it’s often used to treat wounds, helping them heal. When suffering from skin lesions, this herb can prevent infection and reduce pain. • Oxygenator: If you have heard of oxygen treatment, this herb offers similar effects. It breaks down infectious or parasitic particles in the body, destroying them before they cause damage. It’s even been shown to protect healthy cells while destroying unhealthy ones. Artemisinin or Qing hao su, is he main active constituent of the herb Artemisia annua (sweet wormwood). Good quality Artemisia annua 5:1 extract contains around 2.5% pure Artemisinin, other co-factors in the extract support it’s actions. Artemisia Annua is a plant that grows in Southeast Asia that Dr. Rowen has used in the past to treat intestinal parasites. It is also considered a safe malaria treatment. When Dr. Rowen discovered a report by Drs. Henry Lai and Narenda Singh, bioengineering professors at the University of Washington, that indicated that the herb “might provide a safe, non-toxic, and inexpensive alternative for tumor patients”, he started using it with tumor patients. Dr. Lai and his colleague, Dr. Singh, had found its use dramatically killed breast-tumor cells and leukemia cells while leaving normal breast cells and white blood cells unscathed. One of the patient’s Dr. Rowen worked with was a 47-year-old female with stage-4 breast tumor with mets to the spine.. She used IPT, high-dose nutritional therapy, dietary changes, dendritic cell vaccine, multi-step oxygen therapy, and more. All of her symptoms regressed, but the CT showed no change. When artemisinin derivatives were added, greater results were obtained. Dr. Singh tested some products, finding perhaps 50 percent of anti-tumor activity in sweet annie 5:1 extract against cultured tumor cells. It’s important to discuss Artemisinin with your doctor before your first dose. The herb can potentially interact with other medication, especially those that are taken to treat seizures. Artemisinin may also affect liver and kidney enzymes. Diabetics and pregnant women and post partum women with anemia should not take this supplement. It should not be taken together with Radix et Rhizoma Rhei, common name Rhubarb Root and Rhizome, Radix Angelicae sinensis also known as Chinese Angelica Root, Tang-Kuei or Dong Quai Root or Radix rehmanniae, also known as Rehmannia Root, Chinese Foxglove Root. This herb may also interact with calcium channel blockers and antifungal medication. Artemisinin inhibits the proliferation, migration and tube formation of human umbilical vein of endothelial cells, inhibits vascular endothelial growth factor. In tumor cells artemisinin reduces the expression of VEGF receptors and slows down the growth of human ovarian carcinoma. Some may find Artemisinin too “cooling” with symptoms such as tingling. If this occurs, then the dosage should be reduced, bear in mind however that, Sweet Annie is not pure Artemisinin, but the Artemisinin content will be higher at high dosages. 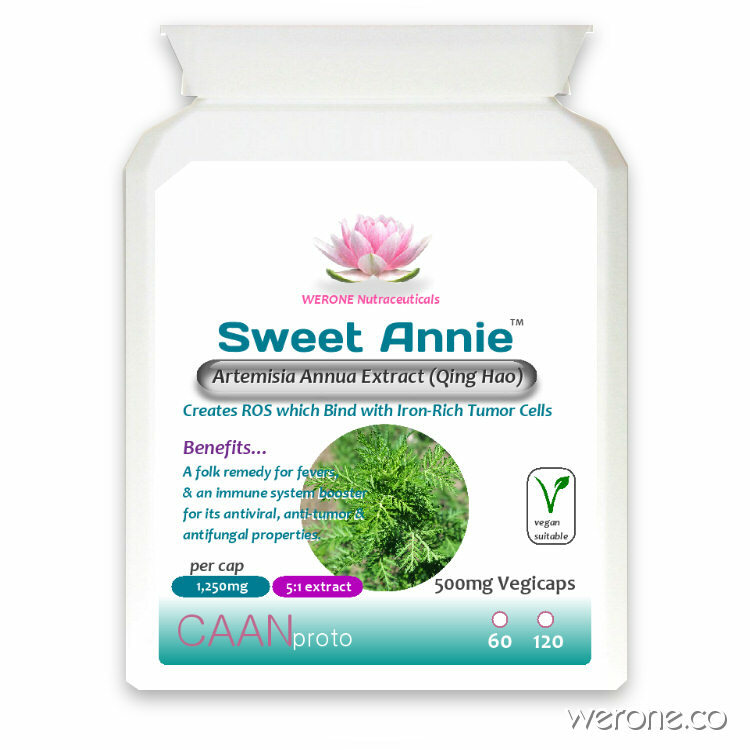 Sweet Annie can be taken 30 mins before breakfast with Krill, Fish Oil or Olive Oil and Vitamin C (1g) combined with a diet containing green tea taken after each meal, CoQ10 and pancreatic enzymes and Krill Oil or Cod liver oil (for its omega-3 and vitamin D) and conjugated linoleic acid (CLA). Take 2-3 capsules (2 x 500mg) twice daily, firstly before breakfast and then 3.5hrs before bed. Generally, 4 – 6 capsules per day can be used for at least 6 to 12 months. Take 8 days on, then 3 days Off (see below*). After that, dosages can be reduced slowly. Any iron present from residual food may neutralise the peroxides (ROS) which are the actual free radicals which damage tumor cells. Milk is one of the few foods with minimal iron. Whole milk (A2 or Raw), cottage cheese, or yogurt have ample fat to enhance absorption. Other ingredients: CoQ10, Vitamin B5, Panax Ginseng, HPMC Vegan Capsule. Don’t take at the same time as other antioxidants such as Vitamin C, Vitamin E & GSH (Glutathione) from Coffee as they compete with Artemisinin’s actions. Sweet Annie is LIKELY UNSAFE when taken by mouth during pregnancy. Animal studies show that drugs made in the laboratory from artemisinin, a chemical found in sweet Annie, can cause death of the fetus or birth defects when used early in the pregnancy. The safety of using sweet Annie during the last 6 months of pregnancy is not known. Artemisinin inhibits inflammatory response via regulating NF-kB and MAPK signaling pathways. pretreatment of cells with artemisinin prevented the TNF-α-induced expression of NF-κB target genes, such as anti-apoptosis (c-IAP1, Bcl-2, and FLIP), proliferation (COX-2, cyclinD1), invasion (MMP-9), angiogenesis (VEGF), and major inflammatory cytokines (TNF-α, iNOS, and MCP1). We also proved that artemisinin potentiated TNF-α-induced apoptosis. Moreover, artemisinin significantly impaired the ROS production and phosphorylation of p38 and ERK, but did not affect the phosphorylation of JNK. Taken together, artemisinin may be a potentially useful therapeutic agent for inflammatory-related diseases.